Bentos II is a small and deep reef in between Lanzarote and Fuerteventura. Bentos II is a reef some eight kilometers from the coast in the direction of Lanzarote. This is the deepest point in this area and will cost you a twenty minutes boat ride. The reef starts at 20 meters and falls away to some 35 meters, with the first ten meters being the most interesting. 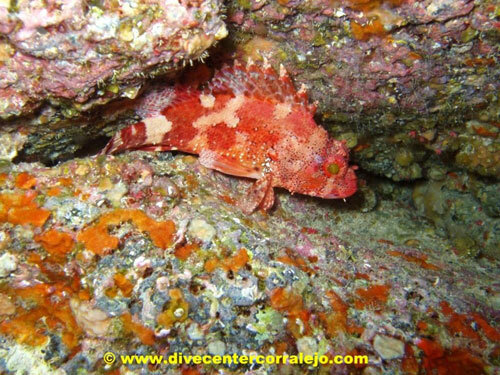 Many Scorpion Fish can be found here as well as the occasional Dusky Grouper, Barracuda, Atlantic Bonitos, Yellow Fin Tuna, Bluefish, Common Bream, Gilt Head Bream, Blue Spotted Sea Bream and Red Banded Sea Bream. This area is due to its depth recommended for experienced divers only.